There was yet another very good turnout for the latest JVAC match fished over both the Horseshoe and Four Island pools on the Decoy Lakes complex. On the Four Island Lee Kendal took the honours with a 115lb 13oz net of carp and F1s from peg seven all caught on a shallow pole rig with caster. Second was Guy Dew with 93lb 5oz. Over on Horseshoe Paul Faulkner won from peg 18 with 120lb 8oz followed by Gus Gausden on peg 10 with 89lb 1oz. This was also a club pairs match which saw Faulkner round off a good day as he joined up with Nick Carlton to win with a combined weight of 192lb 11oz. In the Decoy Lakes Over 60s match on the Willow Lake it was the in-form Keith Rayment in top spot. He drew peg 33 and caught on the pole and paste approach with a few of the better samples also being taken on cat meat fished in the margins which saw him finish with 141lb 10oz. Second with 139lb 5oz on peg 31 was Roy Whincup and third Chris Saunders with 116lb 9oz from peg 27. Webb’s AC fished the Horseshoe Lake at Float Fish Farm Fishery on Sunday and enjoyed some great sport. Top rod with 99lb 15oz from peg seven was Phil Jones. He alternated between the feeder and pole lines catching on meat and sweetcorn. Second on peg two was Marcus Webb with 86lb 3oz followed by Kevin Peacock (77lb 5oz) and Peter Harrison (64lb 10oz). The Saturday open matches at Float Fish Farm Fishery seem to get bigger and bigger each week, which is no surprise really as the lakes are in great form. 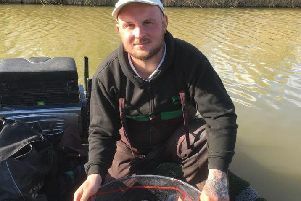 Mark Cree, the recognised master of the Two Island Pool, showed his class on the Horseshoe Pool this time, winning with 205lb 15oz from peg 21. Runner-up was Danny Carlton on peg 17 with 145lb 7oz, then came Roy Wells on Two Islands peg four, putting 142lb 6oz to the scales.